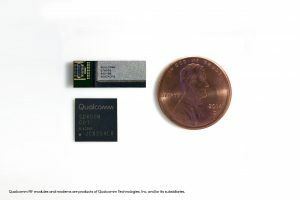 Qualcomm announced today that the company is sampling mmWave modules to OEM’s who will embed the technology into 5G mobile handset devices. This is a major breakthrough within 5G as, until recently, many within the industry did not think mmWave was viable other than for fixed wireless use cases. In fact, there were carriers suspect of its R&D challenges. This distances Qualcomm from its competition since they are the first to overcome many of the technological hurdles of mmWave including RF propagation issues, software/prioritizing scheduler complexities, thermal issues, and physical placement of the modules within small handheld devices. Qualcomm announced the company is sampling the first commercial 5G mmWave antenna module and sub-6GHz RF modules for smartphones and other mobile devices, mainly believed to be mobile hotspots. Early handsets will have plenty of Qualcomm technologies within. This includes the RF-front end, LTE, three or four mmWave modules, the X15 modem, and an LTE baseband. It will not be possible to mix Qualcomm’s 5G and RF-front end solutions with competitor 4G antennas and RF front-end, so Qualcomm will be able to sweep all early design wins being first to market. The QTM052 mmWave antenna will work in tandem with the Snapdragon X50 5G modem. These will incorporate many of the R&D feats Qualcomm has been working on including beam steering, beam forming, and beam tracking. These technologies will help overcome many of the transmission land mines including non-line-of-sight, indoor penetration, and hand placement on the device. The QTM052 and Snapdragon X50 5G modem include a 5G NR (new radio) transceiver, power management IC, RF front-end components and phased antenna array. Support will be up to 800MHz of bandwidth in the 26.5-29.5GHz, 27.5-28.35GHz, and 37-40GHz mmWave bands. 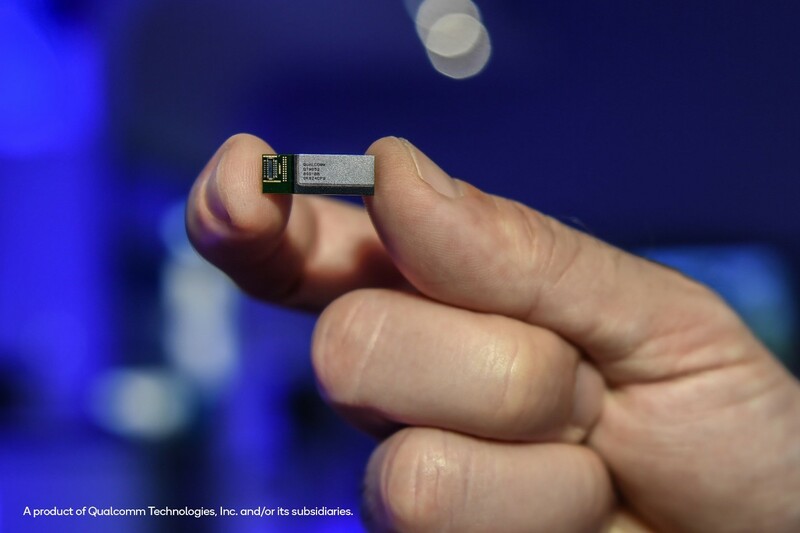 As these are first generation devices looking to take advantage of 5G networks upon availability, look for Qualcomm to continue to shrink the size, reduce power needs, and add additional bands. Minimizing the footprint of the mmWave module has been another major hurdle overcome by Qualcomm. Qualcomm has been working with OEMs helping with industrial design, materials being used, software bugs, and thermals for placement of three to four modules within a single smartphone. The baseband will be able to talk with up to four mmWave modules, most commonly placed on the top edges and mid-part of the device. Qualcomm expects devices to begin launching in 2019. It will be interesting to see how these devices work in the wild. Each network generation leap has had issues with power management. It is to be determined how well Qualcomm has integrated power management with all the new components. The new, advanced 7nm process will help with power efficiency. But, we will have to wait until devices are in the market to see if this Achilles heel of the technology has been adequately addressed. Huawei has been working on long-distance transmission over 39GHz mmWave and has announced trials with NTT DOCOMO. MediaTek announced its 5G mmWave antenna display at Computex 2018. At MWC 2018, the company announced it was working to bring mmWave antenna modules suitable for smartphones and other Internet-of-Things applications. IBM and Ericcson announced a two-year collaboration on a 5G mmWave phased array antenna solution. Intel is working on mmWave solutions and has pointed to partnerships and use cases aimed at large sporting events. 5G solutions announced with Spreadtrum (Unisoc), Sprint, and others. There are many companies pursuing mmWave within mobile devices, however, Qualcomm is the first to officially announce sampling of modules. 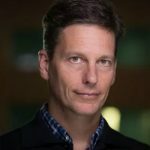 Who will be implementing mmWave and will it grow to meaningful adoption? Verizon and AT&T have been the first carriers to announce support of 5G mmWave for use with mobile devices. T-Mobile and Sprint are taking a less urgent, wait-and-see approach content to see how the technology matures. More global carrier announcements are expected soon. Early performance will be key to pushing further adoption. mmWave is very effective in covering dense, indoor environments. It is also congruous for urban environments. However, both OEM implementation costs and network enhancement costs are high to implement. Many global carriers may look to alternative solutions, if easier and less costly to implement. For more details on 5G global rollout plans, see (here).